اریک اریکسون (به انگلیسی: Erik Erikson) (زاده ۱۵ ژوئن ۱۹۰۲ – مرگ ۱۲ مه ۱۹۹۴) روان‌شناسی آمریکایی است که به خاطر ارائهٔ اصطلاح «بحران هویت» معروف شده‌است. ↑ ۱٫۰ ۱٫۱ "Erik Erikson, 91, Psychoanalyst Who Reshaped Views of Human Growth, Dies". The New York Times. 13 March 1994. Retrieved 19 October 2017. ↑ ۲٫۰ ۲٫۱ Burston 2007, p. 93. ↑ Stevens 2008, p. 109. ↑ McLeod, Saul (2017) . 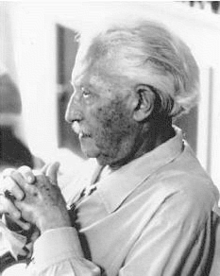 "Erik Erikson". Simply Psychology. Retrieved 20 October 2017. ↑ Heathcoate 2010, p. 257. ↑ Eckenfels 2008, p. vii. ↑ Ireland, Corydon (17 October 2013). "Howard Gardner: 'A Blessing of Influences'". Harvard Gazette. Cambridge, Massachusetts: Harvard University. Retrieved 20 October 2017.